I’m currently baking the cake as we speak. The batter tasted delicious and I can’t wait to try it when it’s done! I’m making this for Christmas Eve tomorrow. I figured I would make the cake tonight and let it cool. And either add the milk tonight so it has 24 hours to soak or add the milk early tomorrow morning so it has 11-12 hours to soak. My question is would 24 hours be too long to soak it? If I do add the milk tonight and soak for 24 hours would I be able to add the whipped cream in the morning or should I wait till the evening to add the whipped cream, like and hour or so before serving? Thank you! Hi Ashley, 24 hours in advance should still taste delicious! 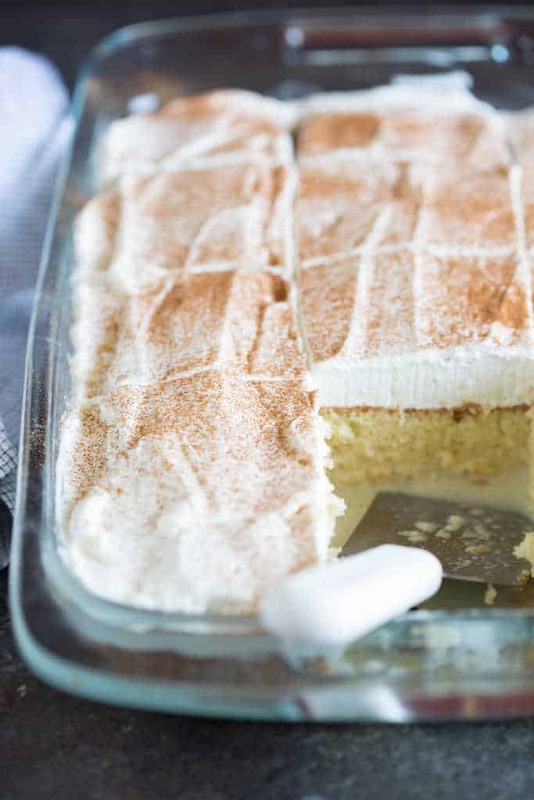 And you can definitely add the whipped cream in the morning, if that’s easier for you. You don’t have to wait until right before serving. I’d love to hear how you like it! It turned out wonderful! Couldn’t have been more perfect, everyone loved it. Thanks for the great recipe! OMG! My boys loved it. I was just right. Thank you. I am not sure what I did wrong. I followed the directions exactly as written but I was very disappointed as I love this cake when I go to Mexico. The cake was more like a pudding – it was very mucky and not like cake at all. Any suggestions as I would like to try it again. This cake turned out perfect!!! I followed the recipe to the letter, and I ran into no issues. The part I am most happy about this cake is the consistency. 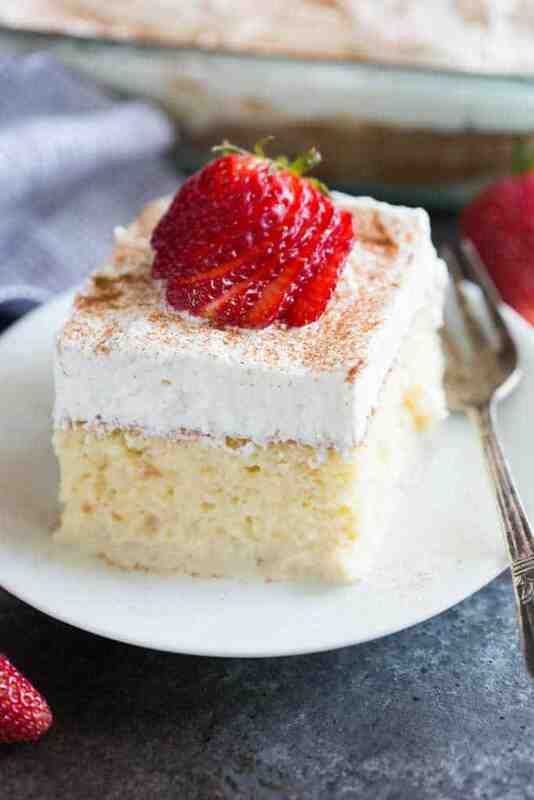 I prefer my Tres Leches to not be too wet. 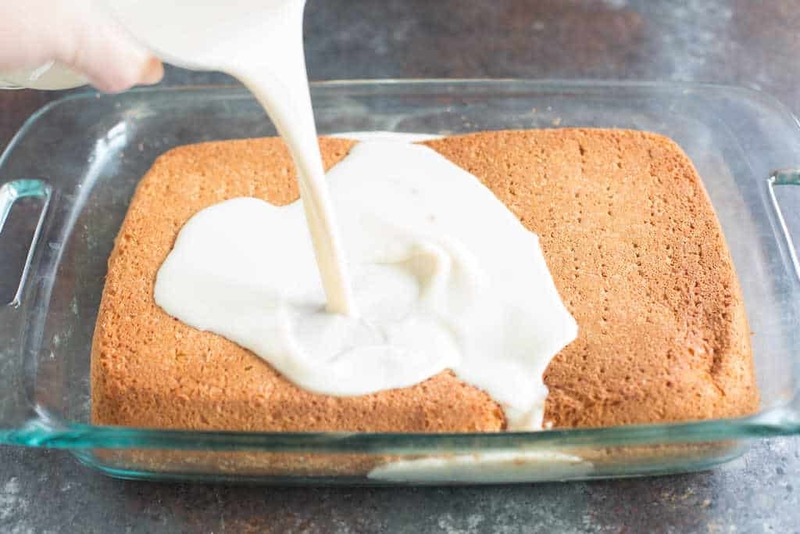 When a cake has not absorbed the milk mixture, and the liquid pools at the bottom, I usually lose interest. This cake does not do that, and retains all of the milk! Also, when you pour the batter into the 13×9 pan, don’t worry about the low-level of batter. She will rise in the oven!!! I plan on making this cake today and just curious how it works without any butter? I wanted to make sure I wasn’t leaving anything out? Thanks!!! I did something wrong. My cake was so thin but I followed the recipe exactly… Will try again tomorrow. Absolutely wonderful! Only thing I did for fear of the cake collapsing was turn off the oven and leave the door open for a while to let it cool slower. It stayed very puffy. Oh and the whipped cream frosting I added a scoop of dolce after it was whipped and whipped it some more. It was great!!! I bake alot!!! This is the best cake I have made!!! I made my own evaporated and condensed milk. My eggs were fresh from the farm!! This is an awesome cake!! Top on my list! This receipe is delicious. I doctored it up a bit. I added 1 tsp coconut extract to the cake batter (with the milk) and to to the soaking milk. I added 1/2 tsp of rum each to the soaking mixture as well as to the whip cream frosting. Cake was decimated at office party! This looks delicious. I’m having a party for 20 and was figuring I’d probably need to make two. My only concern is the whipped cream. 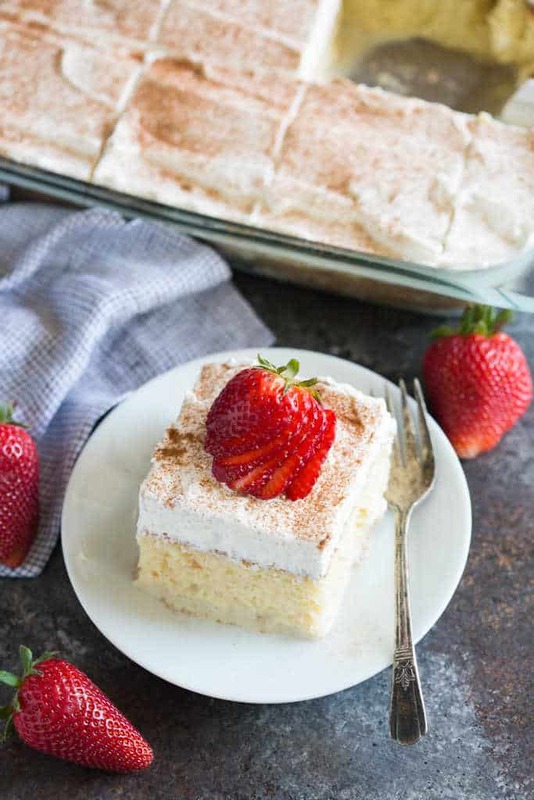 I really want to make this ahead of time, but with all the other cooking I have to do, Im wondering how long the whipped cream will last? Should I refrigerate the cake with the cream on top? Or can I be lazy and buy canned whipped cream and just spray on before serving? Hi Amy, how fun! 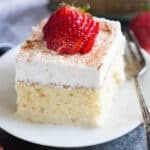 You should be fine to make the whipped cream topping (be sure to beat it until it’s very stiff), frost the cake with it, and store it in the fridge, covered, a day ahead of time. 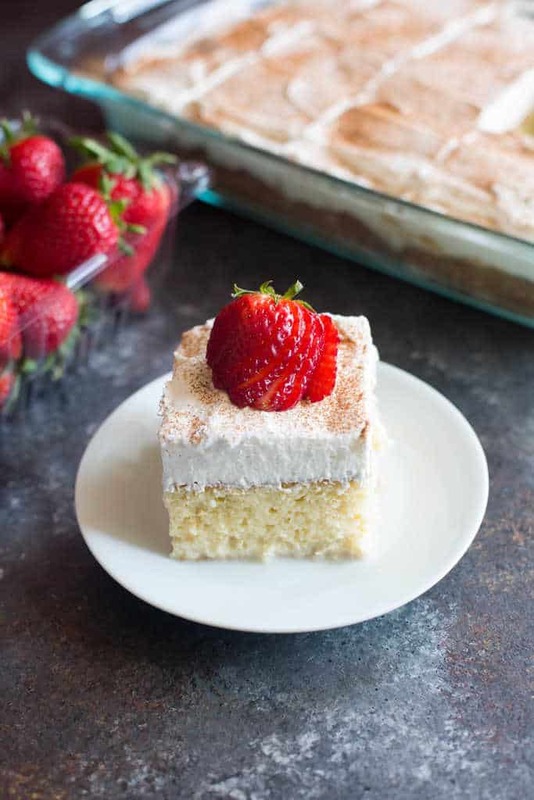 Also, I would use powdered sugar instead of granulated sugar in the whipped cream–it should help stabilize it better.